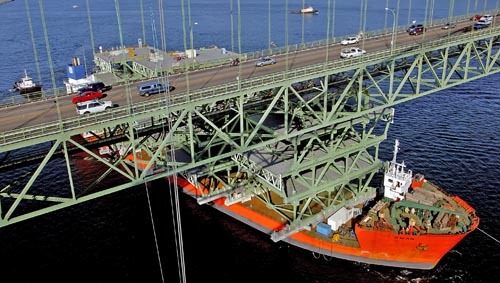 삼성중공업에서 만들고 있는 New Tacoma Bridge의 상부 데크를 운반하던 도중 데크위에 설치되어 있던 비계가 기존 Tacoma Bridge와 충돌하는 사고가 발생했다. 교량의 형하공간을 충분히 감안하여 선적을 했을텐데, 사고 원인은 뜻밖에도 miscalculation. This entry was posted in 세계의 교량 and tagged accident, cable stayed. Bookmark the permalink. Post a comment or leave a trackback: Trackback URL.